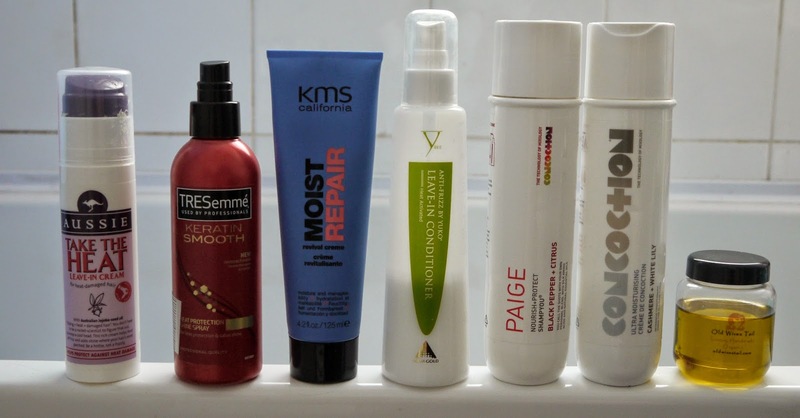 Hello lovelies, today I thought I would share with you all my current hair care routine, I do change my products up a lot but these seem to be stern contenders at the minute so I thought they deserved a little mention on here. So first shampoo and conditioning, Nourish & Protect Shampoo in Black Pepper & Citrus* and Ultra Moisturising Creme in Cashmere & White Lilly* I was very kindly given these concoction treats a while back but I put them in a 'special place' whilst I was sorting my house out and they got lost! It wasn't until recently when I moved two rooms around I finally found them, I was so chuffed they are amazing products! I love how my shampoo is personal to me with my name printed on and the scents of both are beautiful. My hair has never been softer and felt so good since using these. So if you was to order from concoction for your shampoo, you would pick a scent, choose two shots which they have an amazing range for, coloured hair, to give moisture, for volume, thermo straight serum, calming care for roots and curl serum. Then you would choose your conditioner to match or mix up. I have never seen anything like this and I will forever be repurchasing as my hair hasn't felt this good in ages, I couldn't recommend these products enough to you. If I'm not drying my hair and it's a couple of hours before bed I tend to just use a leave in conditioner so my hair doesn't get tangled and the scent of Anti-frizz by Yuko Leave in conditioner* is unreal, like apples I could just spritz this all day its devine. It leaves my hair feeling silky soft and manageable with no nasty knots and stops my mane getting all frizzy. I got this is an amazing goody bag from a blogger event a while back. If I am drying my hair then I tend to use the Aussie Take the heat leave in cream, I also love the scent of this and all Aussie products, you only need the tiniest dot of this as it can make your hair quite greasy quickly and with having short hair you literally need a slither just concentrating on the ends and leaving the roots out. This keeps my hair in good condition and confident to use heat on my hair. Product extras, If I haven't washed my hair and it is just dry and I need to go over with the straightening irons I spray on some Tresemme Keratin Smooth Heat Protectant Spray, again it makes me worry less about damaging my hair through heat, it leaves my hair feeling smooth and shiny and sleek with no frizz, no one likes frizz. Products I use once to two times a week is a leave in cream and oil this being KMS Moist Repair Revival Cream, this smells lush and really does give my hair a good moisture boost, this was recommended to me buy a good childhood friend who used to work at a local salon of mine they sell a good range of KMS hair products and I only ever hear good things about them, if like me you used to be a serious hair dyer and always using heat on your hair and have damaged it, firstly I would obviously advise a good damn trim then topping up your hair with moisture such as creams like this and a good old soaking in hair oil, for example the Old Wives Tail Organically made hair oil, this one in particular is great for hair growth and dry scalps. I am not usually one for putting hair on the roots but for a good moisture burst, keeping your hair healthy once a week I like to soak my hair in this and cover it with a heated towel for an hour, then wrap it up in a turban towel and sleep with it over night, it does take 2-3 washes of shampoo to remove it but the finished results are oh so worth it! If you do suffer with a dry scalp I would recommend getting this on your fingers and putting it on your scalp and massaging the oil in to help calm it down. My hair is left feeling silky smooth, healthier and my hair is definitely growing and I can't thank all these proudcts enough and my new favorite hairdresser Heather! Obviously if your hair is really damaged no amount of product is going to save it, you need to trim those dead ends then keep your hair happy and healthy with products suited to your mane. I really hoped this helped in someway and would love to know what hair products you use.